Do it right the first time, and you’ll be much happier with your Oculus Go experience! From the moment you take an Oculus Go out of the box, it invites you to immediately put it on your head and start having fun. And in theory, you could do exactly that. If you want the best possible experience from the headset, however, you’ll take a few and configure it the right way. Here’s a quick look at how that works. Don’t have an Oculus Go? Check out your options! Your lenses are covered by a protective plastic coating, which needs to be removed or else everything will look blurry in the headset. There are also stickers on the body of the headset. Peel these stickers off, and you’re good to go. After this point, your lenses are exposed. Keep the lenses from direct sunlight in order to keep your display safe, and keep the lenses away from anything that could scratch the glass. You may consider keeping a microfiber cloth nearby in case you ever need to wipe a smudge from the headset in the future. Amazon has a few for $ if you don’t have one handy. Your Oculus Go controller runs on a single AA battery, which is included in the box. While you’re putting the battery in, it’s a perfect time to add the wrist strap as well. An ideal fit for this headset had the two parts of the back strap wrapped around the knot in the back of your head (it’s called the occipital bone) while the top strap is tight between the front and back of the headset. To fully set up your Oculus Go, you need the Oculus app installed on your phone. It is available in the Google Play Store here if you haven’t installed it already. Once you have the app installed, you will be walked through the process of setting up your Oculus Go. If you’ve used the Gear VR in the past, you’ll still have to download the app linked above. All of your purchases and download history are saved so you won’t have to buy anything a second time. Once you are in the app, Oculus will ask you to log in. There’s a big Facebook button so you can log in with your Facebook account, but if you do not have a Facebook account or would prefer to use your existing Oculus account, you can find those options in much smaller text at the bottom of the login screen. If you have chosen to log in with Facebook, or if your Oculus account has a Facebook account attached, you’ll be asked to confirm your privacy settings inside of Oculus. This is a multi-step process, but it looks like there’s only one button to say yes and move on. Actually, each one of the four sections above that blue button are separate privacy settings for you Oculus account. Once your privacy settings have been confirmed, you’ll be asked to turn on Bluetooth so your phone can find the headset. Make sure your headset is close to the phone, especially if there is more than one Oculus Go in the room at the time. Once the Oculus Go has been found, you need to plug the Oculus Go headset in and turn it on using the oval power button on the front of the headset. Once you have confirmed whether you are left or right handed, you’ll be shown a brief safety video on your phone and then invited to put the Oculus Go headset on for the first time. Once you have added a payment method, you will be asked to create a four-digit pin. This pin can be entered on the app or in the headset for making purchases, instead of entering in your credit card information. And that’s it! Your Oculus Go is now fully set up and ready for you to explore. Enjoy! 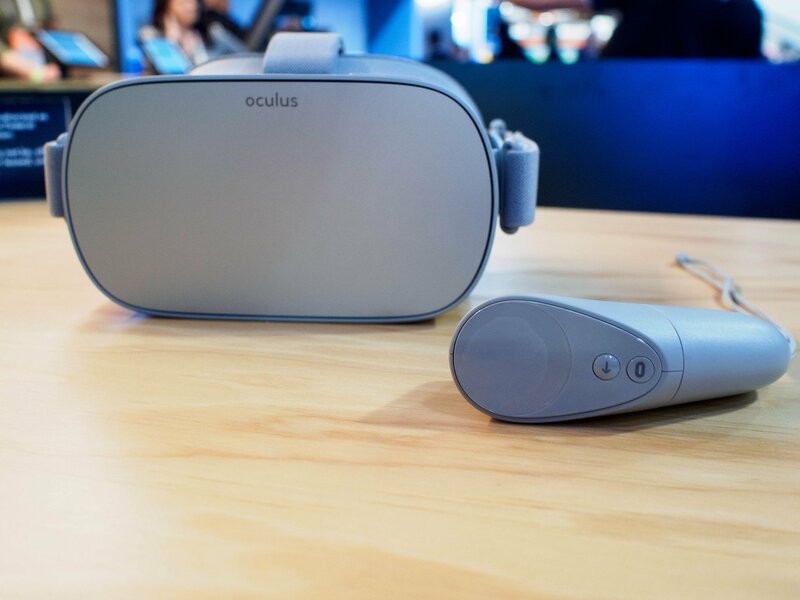 This article has been updated to clarify that you need to download the Oculus app even if you’ve already setup the Gear VR on your phone. Additionally, it has been updated with details on how to get started.